Standing seam metal roofs are an excellent, attractive option for both building and homeowners but in order to maximize the weather tightness and performance, it's also important to choose the right style of underlayment for your standing seam metal roof project. 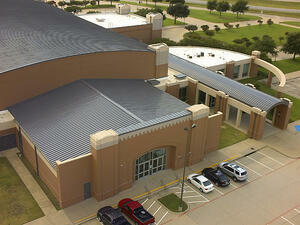 What Are Standing Seam Systems? Standing seam systems are used for a wide range of applications and projects in commercial and residential applications. A standing system features interlocking seams and clips that connect panels. This type of system has a distinctive, attractive appearance. They are manufactured from high-end steel or aluminum which means years of low-maintenance service life. 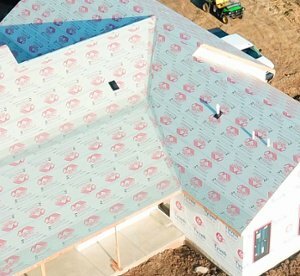 Roofing underlayment is a protective barrier between the roof deck and the finish layer which provides a secondary barrier of weather protection. In the case of standing seams systems, the finish layer is the steel or aluminum panels that are visible from outside the building. There are many different types of underlayment materials and like many other products, the options have evolved and improved greatly over time. For instance, in the past asphalt-saturated felt was the typical underlayment material. However, asphalt-saturated felt required multiple rolls to be used, it buckled and wrinkled as it was rolled out, and it degraded faster than building owners would like. Recently synthetic underlayments have been preferred because they solve some of the problems associated with asphalt-saturated felt. For instance, fewer rolls are typically needed, they are easier to handle and maneuver, are faster to install and lay smoother than asphalt-saturated so there's less telegraphing through the roof. Additionally, synthetic underlayment is safer to walk on during installation and boasts a much longer life expectancy. You can learn more about synthetic underlayment here. As mentioned earlier, an underlayment provides an additional layer of weather protection, helping to prevent mold and other damage over the life of the building. But there's no one size fits all approach to underlayment. Climate, roof slope and even the roofing product used (metal or shingles etc.) all contribute to making the best decision regarding underlayment. The best way to ensure that your roofing system and underlayment are working together to maximize the lifespan of your roof is to work closely with a contractor who has experience installing standing seam systems in your climate. If you’d like to find a contractor or distributor in your area, you can use our search function here. Standing seam metal roofs offer building owners all the advantages of a metal roof with a wide range of design options to choose from. While the exterior design choices might be more "fun", it's vitally important to select the best underlayment too. Our eBook Need a New Roof? How Building Owners Reduce Cost with a Metal Roof explores the roofing options available to building owners including standing seam roofing systems. Follow the link below to download your copy of the Need a New Roof eBook. Since 1963, McElroy Metal has served the construction industry with quality products and excellent customer service. The family-owned components manufacturer is headquartered in Bossier City, La., and has 13 manufacturing facilities across the United States. Quality, service and performance have been the cornerstone of McElroy Metal’s business philosophy and have contributed to the success of the company through the years. As a preferred service provider, these values will continue to be at the forefront of McElroy Metal’s model along with a strong focus on the customer. 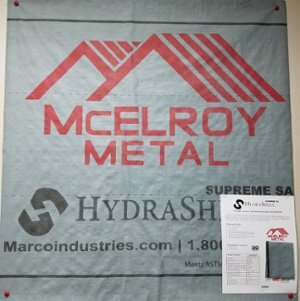 More information can be found at http://www.mcelroymetal.com. Subscribe to our blog to get tips and ideas for commercial roofers and building professionals.